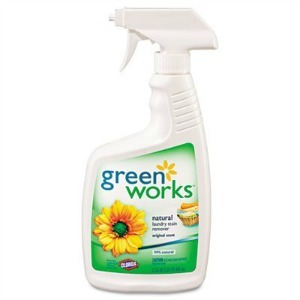 Green Works Natural Laundry Stain Remover: Where To Find It? I received this question about Clorox Green Works natural laundry stain remover from a reader, Joyce. I have purchased this stain remover earlier. I love it and have not been able to find this particular item since. I found other items by Green Works but not this particular item. Thanks for asking me your laundry question Joyce. I looked into it for you, and it appears this product, in its pretreater spray form, has been discontinued. The brand does continue to have several detergents available, as well as other types of laundry stain removers including both an oxygen bleach, in both powder and liquid form. Since it looks like you're needing to look for a new brand of pretreater, check out these reviews of laundry stain removers to see if anything else will work for you. Sorry for the bummer answer, but unfortunately companies change and discontinue products all the time.